Riviera Nayarit (October 21, 2016) - The "Beyond All-Inclusive, Beyond All Compare" Grand Velas Riviera Nayarit introduces its first annual multigenerational Wellness Week inclusive of top chefs, vegan menus, culinary workshops, fitness activities, and spa offerings from October 24-30, 2016. Prominent Mexican vegan chef Miguel Bautista and award-winning soulful vegan author Ellen Kanner will facilitate a myriad of health and wellness experiences - from vegan tastings, workshops on health and sensuality, and cooking and juicing classes, where guests learn to make healthy yet indulgent dishes. Kanner will guide guests through the process of making several original recipes, including Mexican Chocolate Love Bites, a delicious raw treat with Mexican chocolate, low notes of cinnamon, almonds and vanilla, with a pinch of cayenne to add a spicy kick. 1. Pour the raw almonds into a blender or food processor. Process for a minute, or until nuts are coarsely chopped. 2. Add pitted dates, cinnamon, cocoa, cayenne, cacao nibs, vanilla, and brewed coffee. Process again until everything just comes together as a coarse paste. 3. In a small bowl, mix together the powdered sugar and 1/4 teaspoon cinnamon. 4. 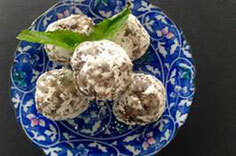 Pinch off about a walnut-sized piece of the Mexican chocolate mixture (or use a teaspoon) and roll into a ball. Drop the ball into the powdered sugar and cinnamon mixture to coat. 5. Continue with the remaining chocolate. For reservations or more information, call 1-888-407-4869, email reservations@velasresorts.com or visit http://vallarta.grandvelas.com/.